An herb is any plant used whole or in part as an ingredient for health, flavor, or fragrance. Herbs can be used to make teas, perk up cooked foods such as meats, vegetables, sauces, and soups, or to add flavor to vinegars, butters, dips, or mustards. Herbs as a group are relatively easy to grow. Begin your herb garden with the herbs you enjoy using the most. For example, choose basil, oregano, and fennel for Italian cooking, lavender and lemon verbena for making potpourri, or chamomile, peppermint, and blue balsam mint if you plan to make your own teas. Our commercial herb grower produces a high quality selection of the more common varieties but also some unusual one. 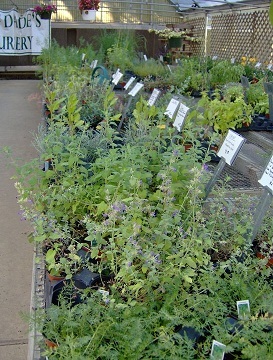 Here's a list of over 100 herbs that are available at McDade's Nursery. If we don't have it in stock we can order it provided it's in season.